It’s the end of week 5 and I am exhausted! I had a terrific week but the plane ride back home took a lot out of me. Perhaps because I did not rest but finished off Harry Potter 7, instead. As far as my Write-a-thon goals go, I was able to finish my edit of Elan Vital! It will go through one more round of critique before I send it out somewhere. Asimov’s, possibly. I mostly worked in the morning since I was able to easily get up two hours before class time. Plus, the group had a writing night which I really enjoyed. So, the LaunchPad Workshop! For those who don’t know, this is a workshop administered by Mike Brotherton, an astronomy professor at the University of Wyoming. The purpose of the workshop is to “provide a ‘crash course’ for [science fiction writers in] modern astronomy science through workshops, guest lectures, and observation through the University of Wyoming’s two large telescopes.” We essentially had a semester of Astronomy 101 in a week. And it was wonderful. We covered several subjects, from really basic stuff like what causes the seasons and the phases of the moon to what happens when galaxies collide and how astronomers know what elements make up distant stars and nebulas. The best part, for me, was the ability to ask fiction writer specific questions. In college, it was always sort of frustrating not to be able to ask “But if I wanted to do this in a story, how could I in light of X?” This workshop was specifically about asking those kinds of questions. So awesome. My fellow attendees were also awesome. A few I know from conventions and other SF gatherings. Some I’ve known online for a while. It was a real treat to spend time with writers I greatly admire, like Vonda McIntyre and Eugie Foster (just to name two). We had a lot of fun in the classroom and at dinner and at the evening outings. One of my favorite things was getting to look through telescopes of various sizes. It’s amazing what you can see with greater and greater powers of magnification. But also amazing what you can see with the naked eye on a clear night, or a pair of binoculars. On Friday night we went to WIRO, where the telescope was so huge that they didn’t even bother having an eyepiece hooked up to it, just a camera. The students there recorded an image for us and Jeremy Tolbert put it together (see above). That was another thing we learned – how those beautiful images of deep space are actually put together. If you look through a telescope, or a camera attached to one, you don’t see the full-color beauty of the finished product. 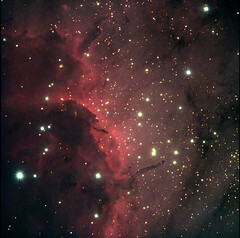 Through the compilation of images taken with filters or taken with different kinds of scopes (radio, infrared, etc.) you can cobble together an image that makes sense to us color-viewing people. This was the first year of the workshop and things went extremely well. All down to Mike and Jim and their assistants. Next year it should be even better. There were 13 attendees. Of them, 8 were female and 3 were people of color. (We would have had four, but one person had to drop out at the last minute.) On the application, the administrators specifically stressed their desire to bring in women and writers of color. It’s definitely something they are paying attention to and I cannot but agree. They’ll probably be accepting applications for next year in January or February, so keep an eye on the website. Even if you’re just a writer starting out and only have a few pub credits under your belt, it’s worth it to apply. They’re looking for writers with a commitment to educating through fiction that reflects accurate scientific knowledge. So, once I’ve slept and recouped I’ll start on my, very short, week 6 story. And then the Write-a-thon will be over! I hope the Clarion West kids are having fun. This upcoming week will be tough.